1- Check the stocks that ARE eligible and determine whether there are enough equities for our portfolio size that are well-diversified by industry segment. If there are, you’re good to go. If not, you can start to invest with these stocks and leave cash on the sidelines for the next entry point. 2- You will note that there are many stocks that report early in the cycle. Allow the ER to pass and re-check our system criteria. Once the post-ER dust settles and if the stocks are eligible, we can enter those positions. ***Some cycles last 5 weeks so entering in the second week or the start of the third should still generate favorable returns. Premium members will find this in the “Resource/Download” section of the premium site. All exchange-traded funds listed in the report have outperformed the S&P 500 (black) over the past three months as of that post. These would be CC candidates to consider if you couldn’t locate enough individual equities to populate your portfolio. These are also appropriate for more conservative investors and those with limited time to devote to this strategy. Although many of the stocks within these ETFs do report, the fact that we are dealing with such a large basket of securities, the ER issue becomes much less of a concern as they tend to counterbalance each other. During the four earnings seasons, we must avoid selling calls on stocks that report in the current cycle, prior to those reports. In these instances, we look to candidates not reporting in the current cycle, wait for reports to pass and then enter into those positions and consider selling calls on the best-performing ETFs. Problem solved! For the week, the S&P 500 declined by 2.8% for a year-to-date return of (-) 1%. BCI: Taking a cautious, defensive posture using low-beta stocks and ETFs with in-the-money strikes. This market is geared to turning bullish once the European issue is resolved favorably. If a stock has an earning report early in the month you say you can use it “after the dust settles”. Can you give a time frame? The Weekly Report for 12-16-11 has been uploaded to the Premium Member website and is available for download. You mention ETFs in this weeks article. I was wondering if you consider selling longer term options with them since earnings reports are not a concern? Thanks. If you plug in the numbers I think you’ll find that selling 1 month options on ETFs is going to give you your best return, so as long as your commissions aren’t killing you it probably would be best to stick with 1 months. Alternatively, you could stagger your sales and sell some 1 month, sell the next month out when you’re about 6 weeks out from their expiration, sell some more when they’re at their 1 month time, and repeat the process, choosing strikes that seem best at the time. And don’t forget, you can always buy back options ready to expire as they get close and have minimal time value left. There’s nothing I hate more than when I get greedy and am waiting to earn that last $25 or so in the last week and something happens to the stock/etf and I end up getting burned on it. Your comments make good sense. Thanks for the advice. Doug’s comment is absolutely spot on, and I have to admit I have been guilty of it, too. Another consideration is that you may give up a very position for next month because you wanted to squeeze that last $25 out of this one. You should always have a list of potentials sitting by your keyboard. However, and I have done this to my detriment, you not just bounce out of one good position and into another one just because you can get an extra $25. Too much bouncing around and you will give up large quantities of gains you could have captured and wasted commissions each time you did it. I wonder if anyone knows why the JDAS option spread is so big? I’ve never seen a gap that big for a stock that seems to be fairly stable. It appears that JDAS just started having options traded. If you look at the open positions there are virtually none. Until you get some active trading you will not be able to get a closer spread. There are not enough buyers and sellers to narrow the gap. I would stay away from this one for the time being. Lightly traded options are not something for the BCI. Liquidity is big factor in any price for any anything. Remember, Black-Sholes is used to calculate what an option SHOULD be priced at, not what it is ACTUALLY priced at. That price is set by traders’ fear, greed, and lack of liquidity (read that as supply and demand). An ER report has the potential to cause a price to change dramatically if the report surprises either way. IF that occurs I will usually wait at least 1-2 days after the report to see where the price settles before I use it to enter a cc position. The Weekly Report for 12-16-11 has been revised and uploaded to the Premium Member website and is available for download. Look for the report dated 12/16/11-REVA. On November 8th this company reported its 11th consecutive positive earnings surprise. Earnings came in @ $0.77 well above the $0.58 estimate. Revenues increased 81% year-to-year. Management increased guidance as the CEO stated among other positives “Our core business is strong and growing…”. SXLP trades at a forward PE of 19x and a PEG of a stellar 0.7. Our premium report shows an industry rank of “A” and a beta of 0.98. Alan, what are your thoughts on a “delta neutral” strategy in a market that is sideways. A Covered calls in both the SDS and SSO at the same time with weekly covered call options. You will receive premiums each week lowerng your cost basis and profit potential in both up and down market possibilities. What do you find positive/negative in this strategy? Thanks in advance. Pump and dump scam…not Rudy! First let me define a few terms for our new members. JR is contemplating using “leveraged” exchange-traded funds as the underlying securities. In this case SSO is geared to return 2x the return of the S&P 500 FOR A SINGLE DAY. SDS targets a return that is (-) 2x the return of the S&P 500 also for a single day. By calling this a “delta neutral” position the assumption is that one offsets the other so that in any market condition we will have no security loss and only option gains. JR, I hope I am accurately describing your proposed strategy. 1- Read the prospectus of each fund and see the vehicles they are using for the leverage they seek to achieve. The SEC is investigating many of the leveraged ETFs as they are not appropriate for average retail investors in many cases. 2- I believe that rebalancing to achieve a true delta-neutral position could be a major challenge for a strategy of this nature. As the prices move in inverse directions, will they move in a similar percentage even if you have an equivalent amount of cash invested in each at the start? 3- Since you have option contract obligations will you be able to rebalance frequently enough to maintain your desired delta neutrality? 4- The best way to determine the success or lack thereof of any strategy is to paper trade for several months. I am not a big fan of leveraged ETFs but I am a conservative investor and so it may be appropriate for more aggressive investors. I am also a believer that leveraged ETFs are most appropriate for experienced, knowledgeable traders. Each one of us must determine whether a certain vehicle is right for us. Thanks for sharing this interesting concept with our BCI community. Should you decide to paper trade this idea, please let us know the results you are achieving, positive or negative. I’m sure our members would be interested in your findings. You made us put on our thinking caps and that’s how we all become better investors. Thank you Alan. You described this strategy perfectly. You are truly an expert in the field and I have always respected your advice and opinions. I will keep you and the BCI community informed of how this plays out. Thank your for this great web site and information you provide. 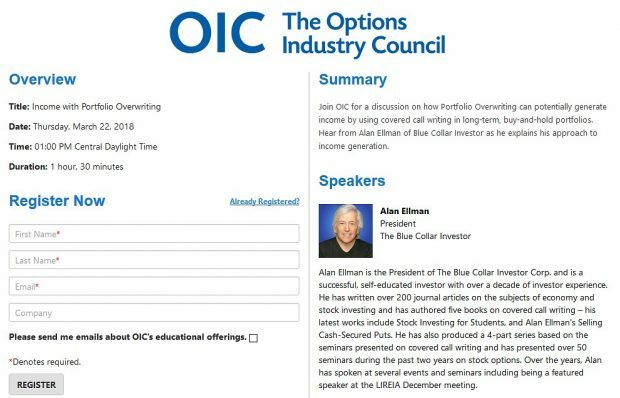 In Alan’s new book he suggests using options that have open interest of at least 100 contracts and/or a bid ask spread of 30 cents or less. At this time jdas options do not meet either criteria. That could change. The “Delta Neutral” strategy outlined above sounds like a much more complicated delta neutral approach than necessary, in my opinion. I think it would be most difficult to try to maintain the position with two different underlyings. If you want to be DN, then I think you might just be better off straddling the Qs or SPY (provided you are allowed to sell naked options in your account). *** This is not for the faint of heart…or for small accounts. When you try to trade Delta Neutral your overall position size can get quite large quite quickly as depending on how the market moves and how frequently you need to try to rebalance. Definitely paper-trade if you’re going to try it at all. And I’d say don’t try it at all unless you’ve got several years of basic option selling experience under your belt already. Some people try to tout DN trading as “safe” and it is not. It can be just ask risky or more risky than anything out there. On Monday I bought DLR for 65.25 and sold the 65 call for 2. Today the stock is up to 67.11 and the option up to 3. Is there any exit strategy I should be looking at or is it too early? All ideas appreciated. Thanks for the reminder. I was looking at some disturbingly larges spreads the past few weeks and forgot the 0.30 or less rule. So many great things in the book its hard to keep track of them all! The Weekly Report for 12-16-11-REVB has been uploaded to the Premium Member website and is available for download. #18) George I am guessing it is the January Option. It’s too early to do anything because to buy back the option would be expensive. If the stock continues to rise the closer you get to the expiration date your decay will help when you need to buy it back and then keep the stock that has a nice profit. Then you can write another call against it in January. Just my opinion. Yes January options. Thanks for the advice. What were the changes to the report? One MINOR change was made last night. GOOG was inserted (on page 1) into the “mixed data with ER this month” section. It remains the same on the running list reflecting a projected earnings release of 1-19-12. I agree with JR that to buy back the option at this time would be too expensive. There is $0.89 time value based on the stats you quoted so you would lose more than half your original premium profit. However, you are on the right track in that a potential exit strategy opportunity may develop. If the price continues to appreciate leaving the strike deeper and deeper in-the-money, the time value will approach zero and closing the position will cost little or nothing. When the option trades at only intrinsic value it is said to be trading at” parity”. These situations create opportunities for us to establish a second income stream in the SAME month with the SAME cash. See pages 264-271 of my new book (Encyclopedia…) for more information on this strategy. I hope I’m not being too picky here but in your last comment you said George would lose more than half his profit if he closes his trade. If it costs .89 to close and his proft was 2.00 how did you calculate? Thanks for clarifying. I’m happy to respond. Since the stock was purchased @ $65.25 and the $65 short call generated $2, we must deduct the intrinsic value from the premium to determine true profit. In other words, only the time value of the premium is true initial profit. In this case it is $2 – $0.25 = $1.75. $0.89 is slightly more than half that initial option PROFIT. I’ve been playing around and I think I can get the Elite calculator to work on Google Docs which has live prices of stocks. Before I waste a few hours has anyone else done this? Does anyone know if you can retrieve option prices on GDocs? What is the difference between the basic ellman calculator and the elite calculator that Frank asked about? Thank you. I got the calculator to work on Google Docs. I just imported it and it ran. Changed the price to the Google finance function price and got real time prices. All I need to do is enter the stock symbol and option information and it calculates the yields etc. I’m going to work on adding retrieving beta and the option price if that is possible. I’ll have some time between the holidays. Could make using the calculator easier/faster. My stock club uses a Google sheet that I designed to evaluate stocks – it speeds it up a lot. 1- “Unwind now” tab which calculates closing your total position mid-contract. 2- The Schedule D” which in and of itself has 6 more tabs. It will calculate long and short -term capital gains (losses) and show final results when positions are closed. The Elite Calculator is FREE to premium members and located in the “resources/downloads” section of the premium site. It also is available to general members in the Blue Collar Store. Interesting. I will have a member of my team get in touch with you. A friend and I are doing something very similar to this on Excel to measure credit spreads on a weekly basis. It takes about 6 hours to skim the data (all stock option prices) from the internet and perform our calculations. However, I’m sure that only using the few picks in the BCI newsletter would only take seconds. He and I have another meeting on MLK weekend so we can design something tailored to BCI then.